Be the first to share your favorite memory, photo or story of Ezora. This memorial page is dedicated for family, friends and future generations to celebrate the life of their loved one. 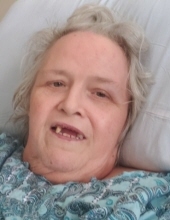 Ezora "Jody" Napier, age 58, of Krypton, KY passed away on April 11, 2019 at the St. Joseph Hospital in Lexington, KY. Jody was born on March 24, 1961 to the late Wilbur Napier and the late Polly Miller Napier. She is survived by one brother: Johnny Napier (Angelia); four sisters: Edna K. Napier (Bobby), Effie M. Coyle, Charlene Stidham (John) & Bobbie Campbell (Tim) and a host of niece, nephews, family & friends. To send flowers or a remembrance gift to the family of Ezora "Jody" Napier, please visit our Tribute Store. "Email Address" would like to share the life celebration of Ezora "Jody" Napier. Click on the "link" to go to share a favorite memory or leave a condolence message for the family.